Wartime talks between Winston Churchill and Joseph Stalin were proving awkward until a drinking session lasting until 3am, newly released files show. In a Foreign Office account of the 1942 Moscow visit, an official recalls finding the men enjoying "food of all kinds... and innumerable bottles". The mood was "merry as a marriage-bell" although Churchill was "complaining of a slight headache" by 1am. The letter adds: "The two great men really made contact and got on terms." Sir Alexander Cadogan, who was permanent under-secretary at the Foreign Office, writes: "Conditions have been established in which messages exchanged between the two will mean twice as much, or more, than they did before." The first meeting with Stalin on the trip "delighted" the British prime minister, before a second meeting at which the Russian leader presented a matter "as sticky and unhelpful as could be". Sir Alexander writes: "Exactly the same technique as last December when, at first meeting, all was honey and at the second everything went wrong. "A very odd technique, and I don't see the point of it." He continues: "This threw rather a cloud on the party, which was not dispelled by the banquet the following night. Nothing can be imagined more awful than a Kremlin banquet, though it has to be endured. "Unfortunately, Winston didn't suffer it gladly." 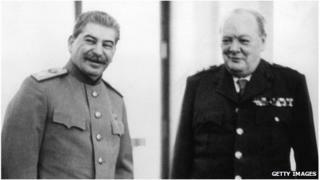 The breakthrough between the leaders came the following evening at further talks with Stalin, alone, that had been requested by Churchill, who is described as "determined to fire his last bolt". After the meeting began at 7pm, it was 1am when Sir Alexander was "summoned to come at once to Stalin's rooms at the Kremlin". He writes: "There I found Winston and Stalin, and Molotov who had joined them, sitting with a heavily laden board between them: food of all kinds crowned by a sucking (sic) pig, and innumerable bottles. Stalin's hospitality was renowned for involving large quantities of alcohol and he preferred negotiating with heavy drinkers. Vyacheslav Molotov was Russian foreign minister. What was the legacy of the Second World War? The letter suggests: "Certainly Winston was impressed, and I think that feeling was reciprocated. "It's very difficult to get on terms through interpreters, but, e.g., on one occasion Stalin replied to a statement of Winston's 'I don't agree with that, but I like the spirit of it'." And it adds: "We broke up soon after 3, giving me just time to get back to the hotel, pack, and leave for the aerodrome at 4.15." The letter is among almost 600 UK government files, mostly-intelligence related and dating from World War II and the early years of the Cold War, just released by the National Archives.